We want to use this medium to inform the general public that The Benue State University, Makurdi hereby invites applications from suitably qualified candidates for admission to Postgraduate programmes leading to the award of Postgraduate Diplomas, Master and Doctor of Philosophy Degrees for the 2017/2018 session. (i) In all cases, ‘A’ Level Passes supercedes ‘O’ Level Passes. Candidates must posses in addition to (i) above, a first relevant degree with a minimum of Second Class Lower Division from Benue State University or any University recognized by the Senate of Benue State University. o For M.Sc Physiology and Anatomy, candidates must posses B.Sc. 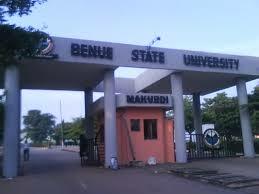 First Class or Second Class in Physiology of the University or from any other University recognized by the Senate of Benue State University. o Medical graduates of this University or any other University recognized by the Senate of Benue State University, who are fully registered with Medical and Dental Council of Nigeria as Doctors. o For M.Sc Mathematics and Computer Science, candidates must posses B.Sc. make up for any deficiencies by attending appropriate module(s) from the School’s undergraduate programme. o Minimum of Second Class Lower Division (GPA 3.00) with Bachelors Degree in Business Administration/Management, Accounting, Banking & Finance, Marketing, Management, Economics from recognized universities. o Candidates must have attained a satisfactory level of performance in the University’s Admission Test & Interview. o Candidates with PGDM from recognized universities and who have passed with a minimum of Upper Credit (GPA 3.50) may also be considered for admission provided the University’s matriculation requirements are satisfied. o For PhD. History, candidates with Master of Philosophy degree may be admitted for the programme, or candidates who do not hold an M.A. in History will be required to take a number of 800 level courses for one academic session. o For PhD programmes in Faculty of Education and in the Department of Business Management in the Faculty of Management Sciences, candidates shall also be required to take a written and oral examination. and Department of Business Management are required to consult the Head of Department as to the availability of supervisors in the areas they wish to specialize before applying. o For PhD. Law, applications should be accompanied by a research proposal. o For PhD. Physiology and Anatomy, candidates must be fully registered with Medical and Dental Council of Nigeria. o Any Degree in Medicine (MBBS and BDS). Degree in Pharmacy, and Honours Degree in Nursing and other Medical professional degrees. o Advanced Diploma in Health Management of Benue State University with a minimum of CREDIT pass average and any other relevant postgraduate diploma/qualifications. Management, Accounting, Banking & Finance, Marketing, Management, Economics from recognized universities. of Upper Credit (GPA 3.50) may also be considered for admission provided the University’s matriculation requirements are satisfied. at least a 3rd Class honours or an HND in Urban and Regional Planning, Architecture or Estate Management with at least Credit level pass. o Candidates must posses basic entry qualification into the undergraduate programme (5 credits which must include English Language and Mathematics). o A minimum of 3rd Class Degree in Computer Science or CGPA 2.00 for Computer Science Graduates or Lower Credit for HND graduates. o Candidates who do not have Degrees or HND in Computer Science but who have minimum of 2nd Class Lower Degree in Engineering, Architecture, Mathematics, Statistics, Physics, Chemistry, Biology, Economics and Geography may be admitted into PGD in Computer Science or any other relevant discipline. i Postgraduate Diploma programmes shall be of one year minimum and two years maximum duration. ii Master Degree programmes shall normally be of one academic year minimum duration for fulltime and two years for part-time candidates. The duration shall not normally exceed two years for full-time and three years for part-time candidates. and five years for part-time candidates. The duration shall not exceed five years for full-time and seven years for part-time candidates.